The Digitone ProSeries Blocker (DPB) comes with a power adapter, line cord and manual. This model covers both Digital or Analog Phone Services, including all regular landline telephone service, cable box converters, DSL modems or gateways, VoIP Digital to analog telephone service (not VoIP digital phone sets), broadband analog adapters for Ooma, Vonage, Magic Jack etc. Also covered are CDMA cellular receivers from Verizon for landlines. For office use, the DPB is fully compatible with fax machines, voice mail and analog CO inputs to PBX or KSU or dedicated analog output ports. Has many new features including Back-Lighted Display, 1,000 Numbers Blocking, Name Blocking, Exchange (555) Blocking, Instant Hang-Up of Unwanted Calls, Virtual Memory, and much more. Caller ID Name and Number service is required for this model to work automatically. It is recommended that you read and understand the Operations Manual before purchase. 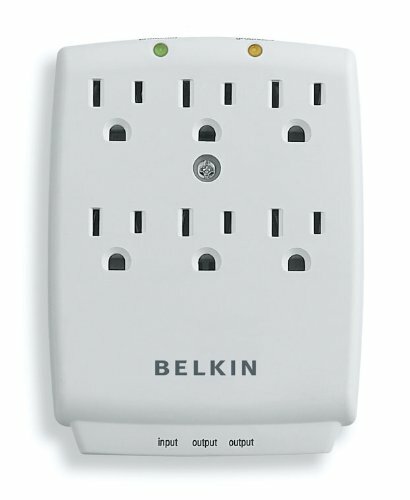 Recommended Belkin Surge Protector for all Digitone power adapters and telephone line. Provides protection from electrical storms and other line surges for a Single outlet. Avoid accidental damage to your Digitone Call Blocker. Includes Phone Line protection on bottom panel. Ground Plug required for complete protection. Illuminated LEDs indicate your devices are grounded and protected. This replacement 24 volt DC power adapter is used for the Digitone Call Blockers DT03-DT04-DT07 series only, not DT05 or DT06. It is a switching adapter and is a direct replacement for the Digitone Call Blocker . If your original power adapter has stopped working due to a lightning strike or other reason, select this adapter. Terms of Sale: Purchase of our products means the customer agrees to these terms below and others on this order page. Warranty: Digitone's products have a 30 day money back guaranteed with 1 year warranty. After 30 days have past from the time of the delivery date of your purchase, the option to request a refund will have expired. Any unit returned without authorization will be refused and returned at sender's expense. Repair options are available thereafter for Digitone's products based on return current shipping rates and repair costs which may be included or extra. See Service Page for repair details. Shipping: Customer must pay for shipping for all returns, exchanges and repairs. Customer is responsible for providing a working delivery address that can be verified through the carrier's address checker in order to complete the delivery of the purchase. Any special shipping arrangements must be made by phone and prepaid by the customer prior to shipping and are not refundable. Once delivery is made by the carrier's determination of: delivery status "Delivered" to the address customer provides, that completes the transaction and any lost delivery is not refundable. Orders shipped that are returned to Digitone as "Undeliverable" or "Return to Sender" will be refunded and the shipping costs are not refundable. Be sure to make arrangements to receive the delivery if you do not have a secure delivery location. Once shipping is initiated, and if you provided an email address for notification, then you will be advised of a tracking number and estimated delivery date. Typically, the delivery date estimated in the email will be on time of 2-5 business days, but can vary due to weather, carrier personnel or routing of the shipment. Refunds: Should you need to request a refund within the 30 day trial period, you must contact us via email or phone at to acquire an RMA authorization. Note: Returns will be charged up to 10% Restocking Fee and will be deducted from the refunded amount. Any unit returned without authorization will be refused and returned at sender's expense. Once Digitone receives and accepts the returned merchandise, the customer will be refunded for the full product amount minus the shipping costs. Assuming your return item is fully functional, not damaged and all components are returned intact, then your refund can proceed. Refund requests are initiated typically within 2-3 business days to our processing bank and they in turn take that request and refund your account you bought the product with within 2-3 business days, posting Monday through Saturdays at most card banks. Privacy: Digitone does not sell, lease, loan, or donate our customer's information. All financial information is retained by the processing bank per banking regulations for a period of 6 months as required. Digitone only keeps copies of the customer's emailed transactions as they occur for the warranty period of 12 months. If a chargeback is knowingly placed on any order at anytime fraudulently, the card holder's account will be billed a $15.00 fee for processing the chargeback.